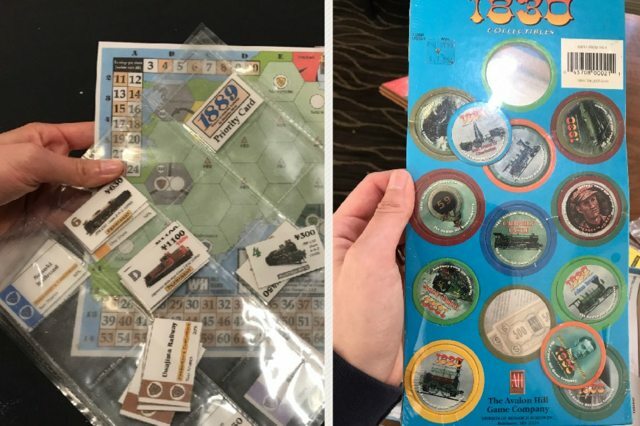 Toby and I got to go to an 18xx convention for the first time! 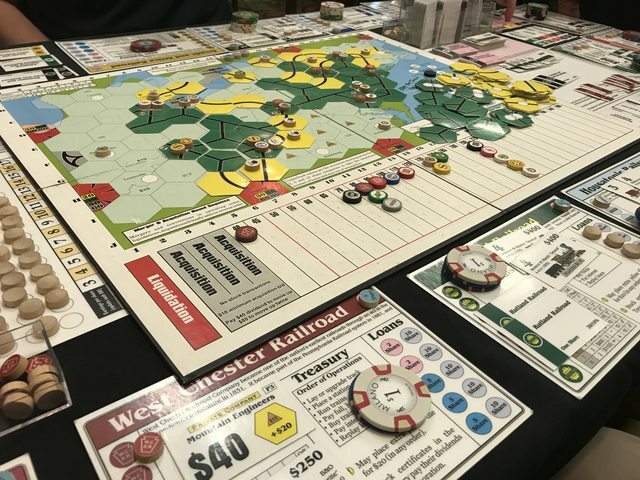 Since we live on the west coast, we decided to go to the Portland 18xx Tournament (there are other ones further away) last weekend. 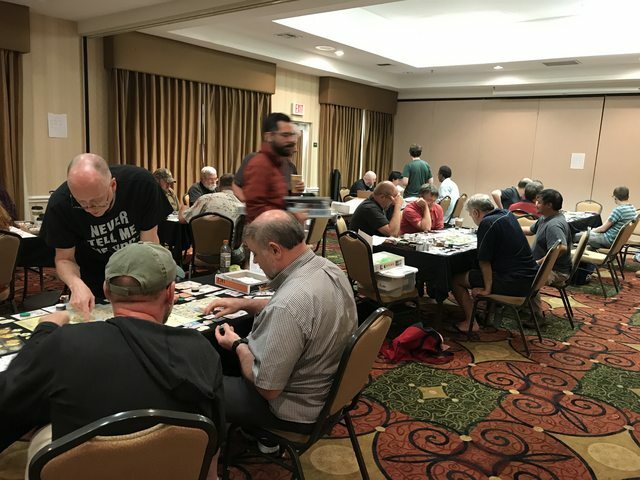 Although it's called a tournament, it's not really a tournament - everyone records the scores of the games they played and get ranked based on that, but most of the people didn't care about the tournament and were just there to play 18xx games and have fun. We were there Thursday through Saturday, and we played 6 total 18xx games. 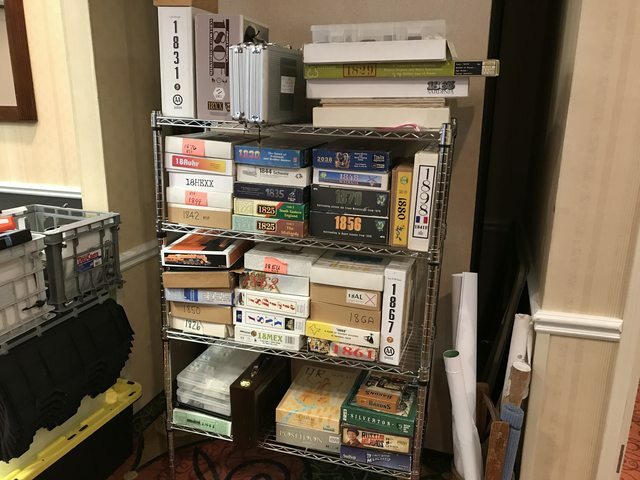 Even though this is one of the smaller convention libraries, it probably has the highest density of rare games! Thursday wasn't officially part of the tournament, but there were still quite a few people playing games. 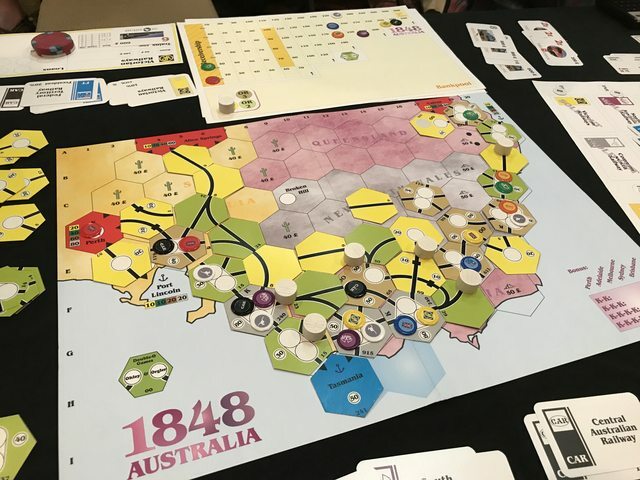 After marveling at the library for a bit and meeting some people, we got to play 1848: Australia, which is a game that Toby had been wanting to try for a while, but we could never find a copy. 1848 is an interesting beginner/intermediate game. Apparently the rail system is really bad in Australia, and each country built with their own gauge (non-standard), so it's really hard to connect. 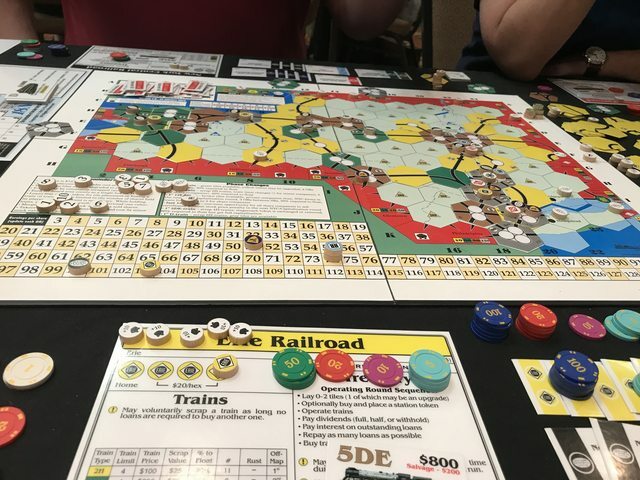 The game simulated this by having different colors on the board that represented gauge changes, and it cost you an extra stop to run through the gauge change, unless you had a special train. So many colors on the board! Thursday afternoon we got the chance to play Fourth Age, a Lord of the Rings themed 18xx game! I had heard about this game a year ago in the Reddit boardgames IRC channel, but it's extremely rare, since it's unpublished, and only a handful of copies were ever printed. So I had resigned myself to never playing. But one of the attendees brought the game, and the designer was there too, so we got to play the game with the designer! I was super excited to play it, since I love Lord of the Rings. Fourth Age is based on 1870, which I own but haven't played. The Lord of the Rings theme comes through in the map (it's a map of Middle Earth) and the corporations. Each corporation has a special power - for example, the Orc corporation can actually destroy track instead of just building it! I wanted to try out the orcs, but I ended up starting with the Dwarves, so I didn't want to ally with the evil Orcs. On Friday we played 3 games!! Even though we said we were gonna take it easy, we ended up playing until past midnight, so Friday was pretty tiring. We started off the morning with 1868, the new Winsome 18xx game. This was the first time I played a game where I realized right away that I lost the game in the private auction! Since there are only 5 companies in the game, it was really bad not to get a company at the beginning of the game, and I didn't have enough money after the private auction, so I was behind the whole game. But I still got my secondary goal of making a super awesome company at the end of the game! Some interesting things about 1868 were that all 4 starting companies started in the same city, so they were all competing/helping for track laying. Also, you can always lay or upgrade two tracks, instead of one on each turn, so the routes were built out really quickly, and we ran out of ordinary straight and curved track! It was also a pretty quick game (for an 18xx). All of us were new (we played 4 players), and the game lasted 3 and a half hours. Since Toby and I own this game, we're excited to try it again. Friday after Lunch we taught 1880: China to our friend. I've talked about 1880 a few times on the podcast, so our friend was interested to see how it was. We stopped partway through the game (after the communism phase), since we decided to end for dinner time. It was fun, and I started completely different companies than I had in my other games, so I got to go for different routes. After dinner on Friday, we played a learning game of 18NY with the designer. Something interesting about this one is that there are +10 tokens on spots on the board, and if you're the first one to run there, you get to keep the token and add it to future runs. There were also coal tokens which were similar, except you get them if you have a special private and you just have to connect to them. I thought that was pretty neat, so I got that private and got 5 coal tokens (out of the total of 6 on the board) for a lot of bonus to my route! But I tend to focus too much on having a great end game company, so I didn't have much money early game, didn't have many shares, and my great company wasn't enough to catch up. 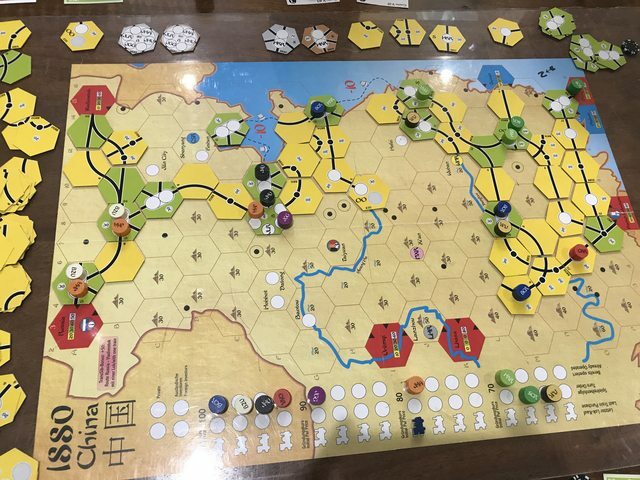 Saturday we only played one 18xx game, but it was a long game of 1817 (took about 9 hours). There's a group of players in Seattle that play 1817 every week (sometimes twice a week) and have been playing for the last 3 years, so they're experts at the game! We were fortunate to be able to play with a couple of people from that group, and it was amazing seeing their thought process as they explained things we had never even thought about. One thing that seems simple now that I know it is taking loans at the end of the game to increase your stock price. The way it works is this - you can take loans at any time, and it lowers your stock price, but then when you pay it back, your stock price goes back up. When you pay out dividends, your corporation can move up twice on the stock track if the dividends are double the price. So you can take out loans before paying out to lower your price enough so that the dividends you pay are double, and then pay the loans back after you jump up! As long as you have enough money to pay the interest, it makes your stock worth a lot at the end of the game! It was pretty awesome learning so much from the Seattle group. That's my company on the left of the stock market, so close to acquisition! We had an amazing time playing 18xx games and seeing all these other 18xx games being played. There were also some neat things in the library - there were a whole bunch of miniature versions of 18xx games! And also, in the copy of 1830, there were some 1830 themed pogs! Since we took this convention easy (we took long lunch & dinner breaks), we also took some time to visit downtown Portland. Apparently Portland is known for its donuts, so we decided to try out Blue Star donuts, which are apparently the best ones. 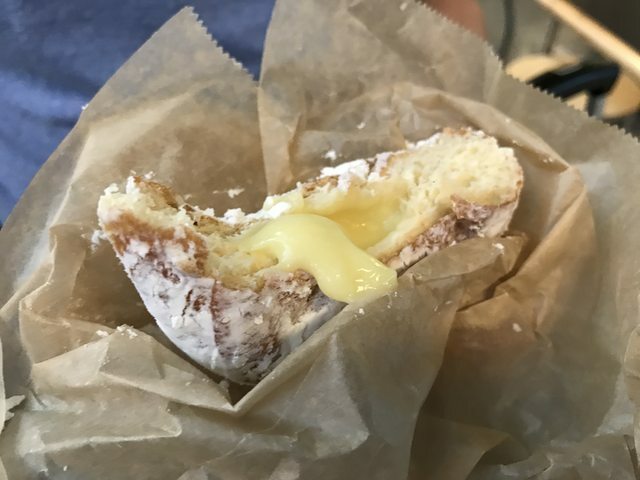 I don't really like donuts, but I still tried some, and I actually enjoyed them. I really liked this lemon tart one with lemon filling. We also had some good food and visited Powell's book store, which is a huge book store! It basically took up a whole block and was filled with new and used books. It also had some decent board games - it had some of the new EXIT games! On Saturday night we also went to a barcade in downtown Portland and played some pinball, which was pretty fun. 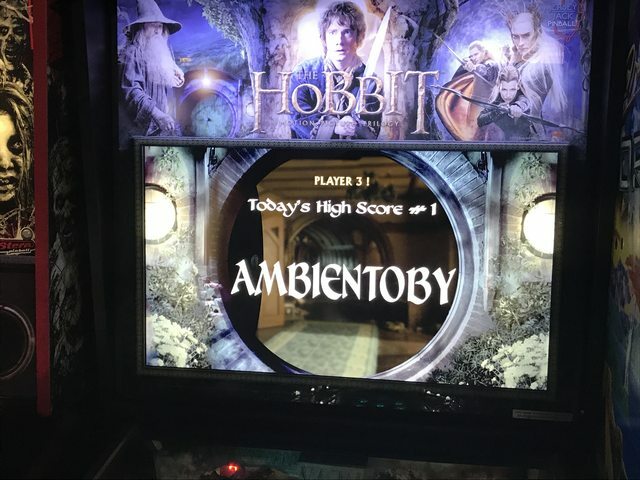 The Hobbit pinball! We got the high score of the day! 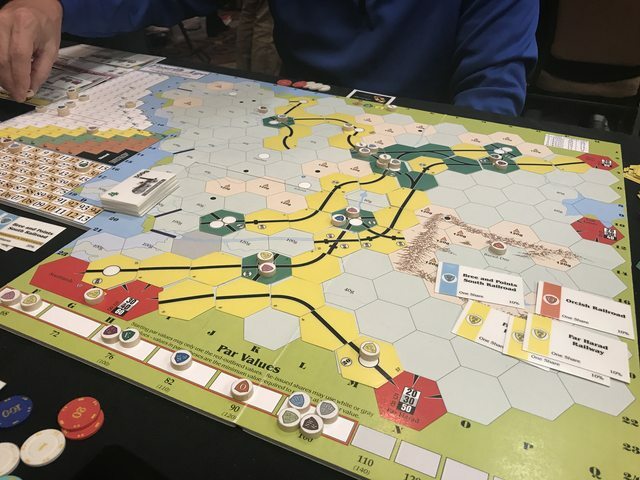 Overall, I had a lot of fun at Portland 18xx Tournament. 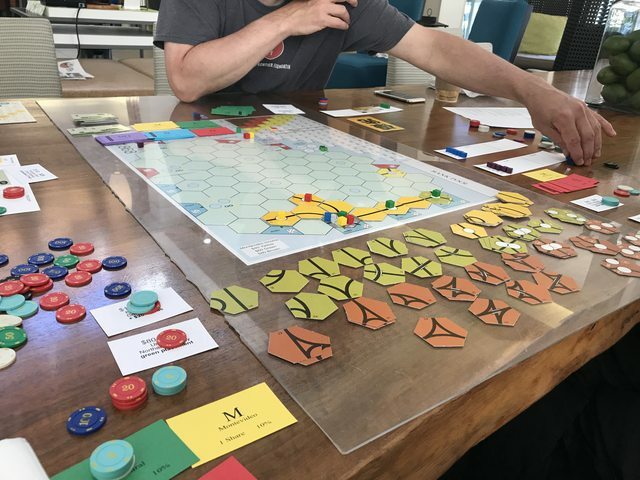 We didn't get to stay for the whole time (our flight was Sunday morning and the tournament ended in the afternoon), but we still were able to play a lot of 18xx games and learn a lot from everyone who was there. It was also really neat meeting "famous" 18xx players and designers, and being able to play games with their designers. It was a small convention (about 30-35 people), so it was easy to meet people and play games with them. Also, we didn't need to bring any games or poker chips! Toby and I are looking forward to going again in the future. The convention was pretty small - this is the whole room!